Cardiff and Vale University Health Board is piloting a campaign supporting carers to continue their caring role, if they wish, while the person they care for is in hospital. 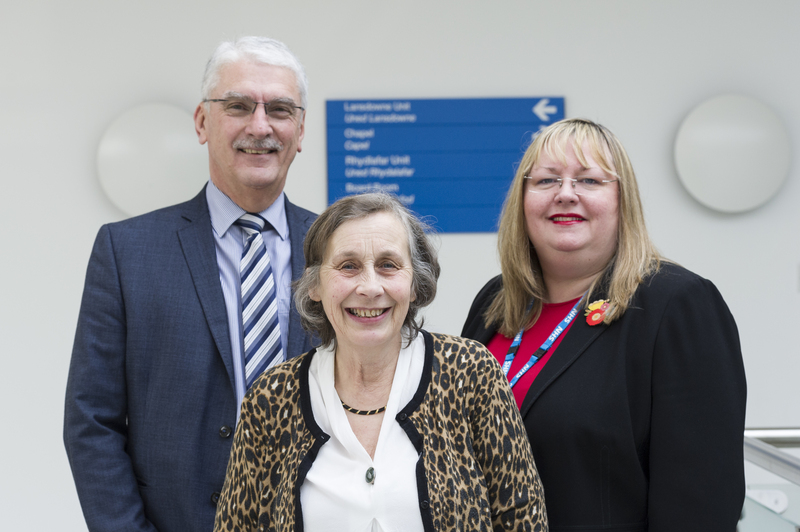 The campaign was launched at St David’s Hospital by Ruth Walker, Executive Nurse Director, Charles Janczewski, Vice Chair and Julia Jones, Co-Founder of Johns Campaign. John’s Campaign was founded after the death of Dr John Gerrard in November 2014 by his daughter Nicci Gerrard and her friend Julia Jones and aimed specifically at carers of people living with dementia. The Health Board is adopting the principles of John’s Campaign ensuring that all carers are incorporated. It is being piloted in seven wards, across four hospital sites; University Hospital of Wales, University Hospital Llandough, Barry Hospital and St David’s Hospital. Priority – early identification of carers. Principles – ensuring carers have a voice, and that they are informed and communicated with. Our Promises – are that we will always welcome carers and where possible we will support them to continue their caring role, if they wish, for example at mealtimes. Finally we ask that carers Please – respect other patients privacy, ward issues and tell us if you need our help and support. Ruth Walker, Executive Nurse Director said; “As a Health Board we are committed to caring for people and keeping them well and by adopting the principles of John’s Campaign it enables carers involvement, should they choose. As part of the pilot Carers Support Leads have been identified in each area and are receiving training to identify and support carers in line with the campaign. A pack is also available containing essential toiletries for carers who have an unexpected stay in hospital. They contain a discount voucher for use at Y Gegin in UHW and the staff restaurant at UHL; aligning to the ethos ‘We care for those who care’. In the time since John’s Campaign was founded, over 1000 institutions have pledged support and a lot of progress has been made. The Health Board will be developing its own pledges of support in the near future.